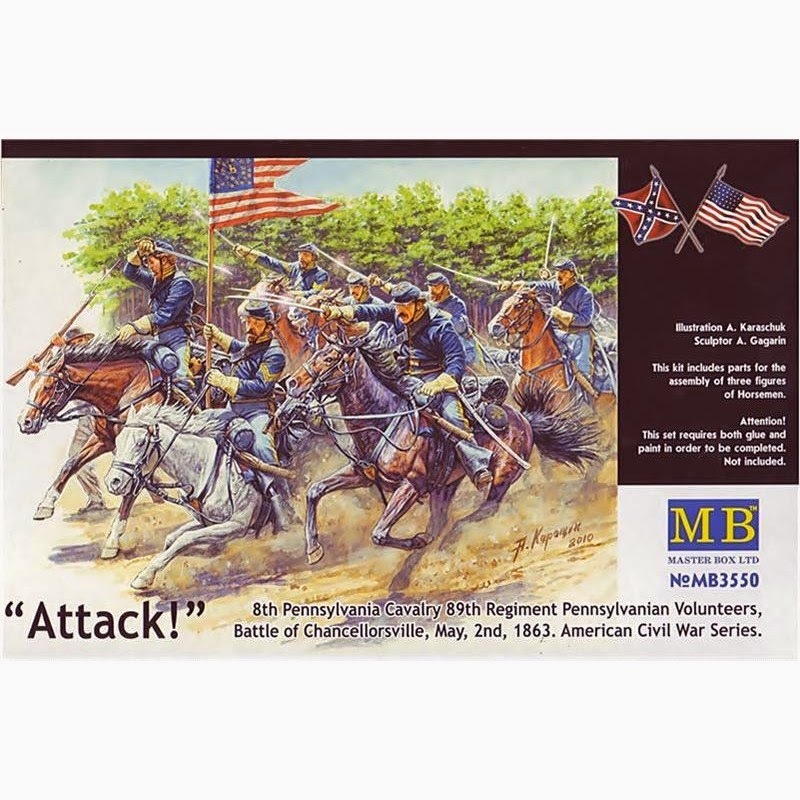 I had purchased the kit really because I had never constructed an American Civil war dio and I had assumed that it would be a welcome break from my usual World War two subjects. When the kit arrived I remembered being impressed with the detail and movement of the figures. 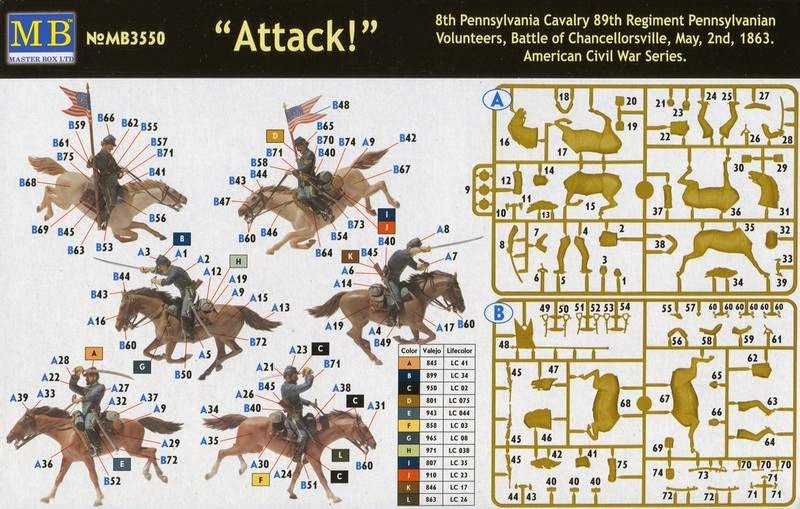 So much so that I elected to buy a second kit and modify the riders so I could have six cavalry in the charge as opposed to the two supplied. The concept for this dio was simple; six riders in full charge over a grass field. After carefully looking at each pose of the riders and horses I decided to put a large fallen tree trunk onto the base (found whilst walking the dog) to depict a horse in mid jump over it while the others horses would be shown ahead of it in full gallop. Like so many of my other "stored" work in progress kits, I ran out of inspiration with a rather sad looking grass finish on the base and not the finish that I had wanted on the figures and horses. Of course I knew how to rectify it, I'd just ran out of enthusiasm to do it. Well here we are a few years later and my interest has been renewed with the construction of my home made grass applicator. (click HERE for details). The re-work of this dio will be kept identical to the original concept as possible. Essentially I want to pack all six riders into a very small space to add as much movement to the piece as possible. This will include some of the horse's seemingly running off the base itself. The figures now repaired and the base coats of paint touched up where needed will be treated to high and low lights in oils with new sword blades added where necessary. For each of the riders I have opted to enhance (as I do with all of my figures) them with oils to bring a little shade and light onto the pieces. I decided to start with the horses first as they are the bulk of each figure with plans to temporarily mount them onto a temporary base board to make my life easier when it comes to oil painting the riders. Once all the riders were secured into place I opted to recess the title plate that I secure to all of my models into the base. Following this, the base was then re-painted in acrylics as it has been a little chipped and battered in storage. Final touches include things like re-touching the bridles, etc in Humbrol silver, painting in the eyes of the horses and riders, ensuring that the mounting pins are disguised in more static grass, etc. Excellent work, love the scene. I have always had a fascination with the US CivilnWar.